Bat pollination is only known (or presumed) in neotropical Gesneriaceae and apparently has evolved independently within several genera (Drymonia, Kohleria, Gesneria, Rhytidophyllum, Sinningia and Paliavana). The flowers are short- and broad-tubed or distinctly campanulate, the limb is ± zygomorphic, coloration is yellowish or greenish with brown or dirty violet spots and nectar is produced in abundance. The chiropterophilous pollination syndrome of some neotropical taxa has been described in detail by Vogel (1958, 1968, 1969a,b) and Skog (1976). Pollination of Sinningia brasiliensis and Paliavana prasinata by Phyllostomidae-Glossophaginae has been documented by San Martin-Gajardo and Sazima (2002a,b). 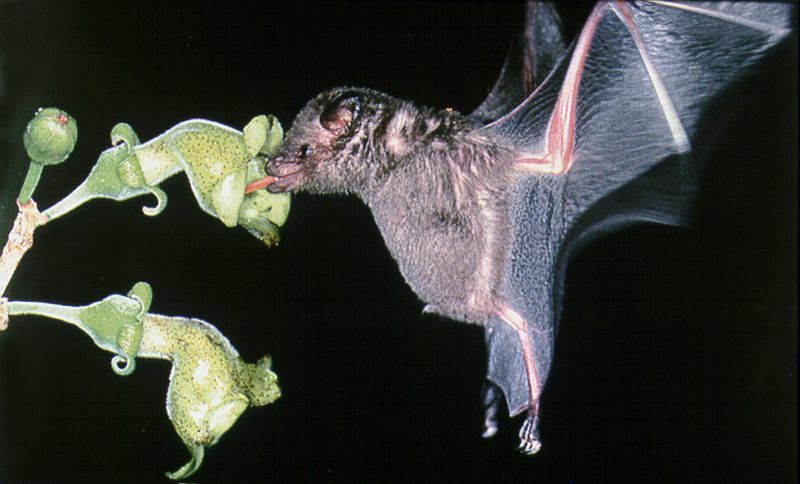 Both species exhibit a typical chiropterophilous pollination syndrome that includes nocturnal anthesis, unpleasant scent and increase of nectar secretion in the night. Paliavana prasinata has the characteristic shape and color of a bat-pollinated flower, and is here being visited by Glossophaga soricina. Photo by O. von Helverson.